StudioPress is one of the more popular names when you think of the expanded WordPress universe. They are premium theme provider that was launched in 2007. Today, they are servicing over 200.000 customers with their trendy themes. They are often praised for their designs, but we must really question is all this beauty just (virtual) skin deep? Signing in is a bit derailing, to say. There wasn’t an obvious log in or register form, so we clicked on the My StudioPress button in the upper right corner. There were a login form and a “Get Started” button… which brought us back to their home page. After that, we clicked on the “Find out more” button that just scrolled us down the same home page. There are a lot of other buttons that will lead you to other parts of their website, but ultimate, if you want to create an account, you will have to buy a product. There are many ways to search themes, but if you are on a budget, there is no search ability to go through themes and rank them by price. You will have to click on each one of them and open a new page to see the price tag. Additionally, you will be welcomed with a ton of information, which is not a good thing if you are just browsing, because what people need while just browsing is a short and concise information. We just started and we are already a little bit frustrated. Luckily they accept PayPal so paying process was made a little bit easier. Only after the purchase will you get a StudioPress account. 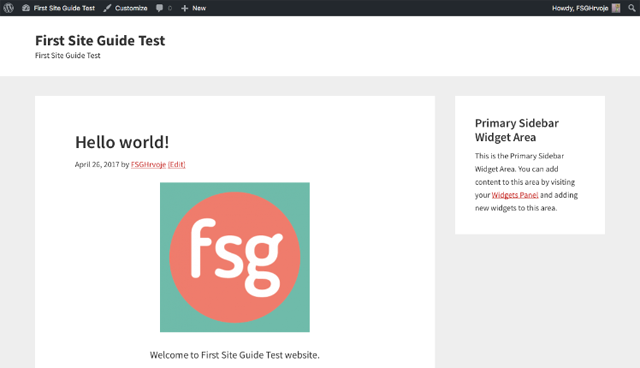 We decided to test out their Genesis Framework, so surely, after the purchase things will get easier? Well, yes and no. If you know what to do (download and install .zip file) it is. But if you are a beginner, you will get a set of instructions that can seem intimidating, because there is a wall of texts and links you will go through. 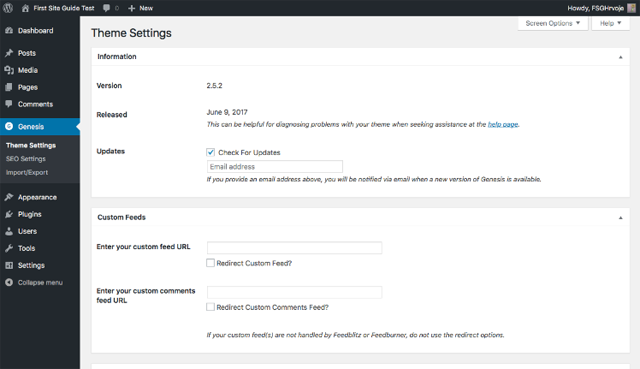 All in all, if you never dealt with premium themes and you just wanted your WP site to look pretty, you might get overwhelmed. Having to go through the whole signing in and setting up process was not really beginner or user-friendly. There were a lot of hoops to jump through and the information was not concise. However, if you are experienced with dealing with any sort of administration or tech babble (which StudioPress is a hybrid of), you will find that the information is out there laid out in a clear and understanding manner. There is just a lot of it. So while it is easy to get lost in it, there won’t be a nook or cranny that is omitted. It is a good and a bad thing, but as time goes by and you get used to their modus operandi, it will get easier. 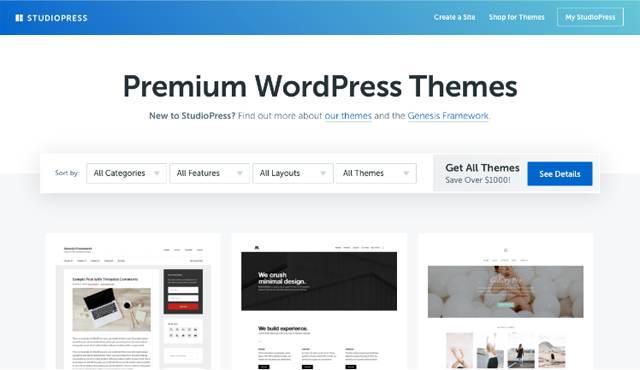 Since we tested out Genesis Framework, and it was noted upon its installation on the WP that you will need to use a child theme ( a theme that will save all of your changes in case of updates of the parent theme) we immediately thought that we will need to buy another theme. However, you will be provided with the free theme and it will be available to download in your account immediately. For a complicated sign in, this was a nice surprise, because it meant less work. And additionally, all of their themes are secure and equipped with malware scanning. Additionally, you can get a one-time discount by buying Genesis Framework and one of the themes at once. It is a great deal considering that Genesis changed over the years, so your website won’t suddenly change. However, its customization options are somewhat limited and if you really want to dig in you will have to code a bit. If you do not want to code, you will have to cash out a yearly subscription for the Design Palette Pro plugin. It has three packages and it will give you various levels of support and number of websites you can use it on. 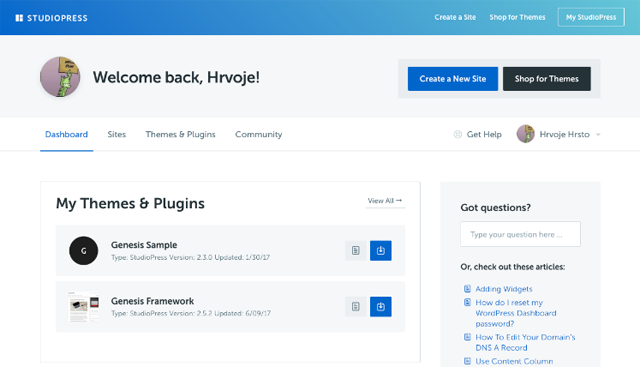 Or you can use a third party plugin builder like Beaver Builder, that is recommended by StudioPress. But beware, they are also affiliates to some, so you won’t see the price tag until you click on it. However, if you want to share your website on your social media, you will have to look for third-party plugins. There are no in-house solutions for the social media in StudioPress, which is a little bit surprising. When it comes to updates and support, there is no yearly fee. With Genesis, you get unlimited support, which we are not sure what exactly means. If that means lifetime support, we are more than delighted, but they are not really transparent with what unlimitedly encompasses. 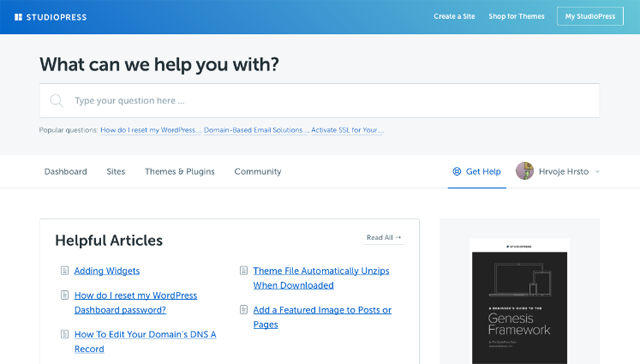 If you find a fault with the StudioPress theme design and graphics, then we honestly do not know what to say. They have excelled hi-res images and their designs are paired with fonts that, in the end, will give you a flawless result. There are 60 themes to choose from and they all look different. They are all responsive, SEO ready, fast and drop dead gorgeous. And there is no sacrificing of the coding to get the pretty design. All themes are fast loading and the only thing that we might say is a disadvantage is their pricing. Slightly above average, but damn worth it. We already mentioned the Genesis Framework because it is versatile and a good base to build up your own theme, especially if you are a developer. And while we frowned upon signing up process or missing place where you can see all of the prices on one page, their theme designs are all but complicated for end users. They keep up with current trends and to pick one or few themes above others is frankly a Sophie’s Choice. So we will leave that to you. There are various levels of support depending on what is your financial involvement with StudioPress. However, another hoop to jump through is that you do not get automatic access to community forums with registering. You will have to register and confirm it via email. While they might look a bit more attractive, they are active, which is the more important part. They also have the knowledge base, FAQ, ticketing system, educational webinars, invitations to regional workshops and meetups and instructions for each of the themes. The only thing they do not have is the live help, but everything else is working so flawlessly that we honestly did not notice that there isn’t any. And that says a lot. There is no one clear place to see the prices on StudioPress, so you will have to dig through a lot of different things. Genesis Framework will cost you $49.96. It will allow you to somewhat customize your themes without coding and to install Genesis child themes. Design Palette Pro is a plugin that will allow you to customize your theme without coding. It has three packages with yearly subscriptions. They will all give you updates and standard support. Basic will cost you $49 and you can use it for 1 website. Plus will cost you $89 and you can use it on 5 websites and you will get priority email support. Deluxe will cost you $199 and you can use it on 50 websites with 3 exclusive palettes and priority email support. There are two plans that include hosting and access to 20 themes. Content will give you standard all-in-one package and it will cost you $24/mo. Commerce will also give you an e-commerce solution and it will cost you $33/mo. 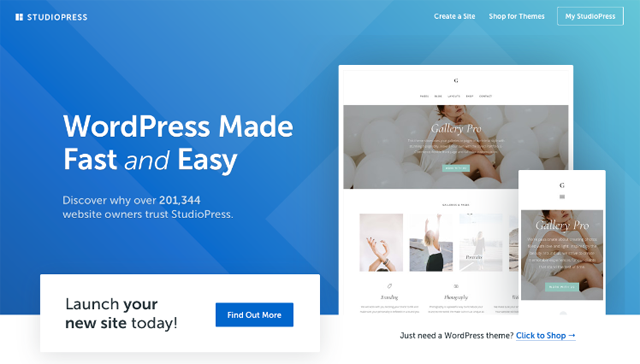 StudioPress is a WP theme provider that takes itself maybe a little bit too serious, but the results are great. Like a talented but obnoxious artist, its character might be a bit too much, but the end results are stunning. Do not get us wrong, everything is as it should be and the design of their themes and the website and the user area is gorgeous. Just sometimes, there will be a lot. Of everything. Which on the other hand means that you will find everything you will ever need. If there are two things we would recommend to their team, is to shorten and simplify the introduction to themes and installation and to make a catalog of their products by the pricing. But, for the price you pay, you will get an excellent product that will last because it is built to last. And everything is low maintenance. So, with the money back guarantee we will dare you to try them out and not to fall in love with StudioPress. You will probably fail.